MFG DAY is an opportunity for manufacturers across the U.S. to connect with the public they serve. HOUSTON, TX, September 22, 2018 — Frazer, a leading provider of custom Emergency Medical Services (EMS) vehicles in the U.S., today announced that it will be participating in Manufacturing Day (MFG DAY) by holding an open house on October 5, 2018, from 10 a.m. to 2 p.m. Most EMS vehicles delivered by Frazer are licensed as ambulances for 911 services across the country. 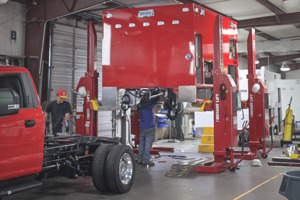 This MFG DAY event is intended to provide members of the public and the healthcare industry with a rare inside look into the corporate culture at Frazer and how generic heavy duty truck chassis are converted into mobile healthcare vehicles through assembly processes at the facility. Guests can register online at their website www.frazerbilt.com or by sending an email to [email protected]. During the MFG DAY festivities, the Frazer facilities will be open and tours will be available. Lunch will be provided for everyone who attends the event. Families are welcome to attend and participate. Billy Cohn, MD, a pioneering heart surgeon from the Texas Heart Institute, will be speaking around noon to provide his insights on breakthrough innovations. Dr. Cohn helped to develop an artificial heart and currently serves as the Executive Director of the Center for Device Innovation at the Texas Medical Center in Houston and Vice President, Medical Devices at Johnson & Johnson. MFG DAY is an initiative designed to raise public awareness about modern manufacturing and to dispel common misperceptions about the processes and workflows of these facilities. Established by the Fabricators and Manufacturers Association International in 2012 and supported by the National Association of Manufacturers (NAM), the Hollings Manufacturing Extension Partnership of the National Institute of Standards and Technology (NIST) and the Manufacturing Institute(MI), MFG DAY is an opportunity for manufacturers across the U.S. to connect with the public they serve. By opening its doors to the public for MFG DAY, Frazer will provide added visibility for those who work in the manufacturing industry. Frazer, Ltd. was founded in 1956 and has more than 30 years of experience in producing EMS modules and remounts for public service agencies throughout the state of Texas and across the United States. Frazer also delivered the first Mobile Stroke Unit in the U.S. and has delivered over half of those currently deployed in North America. With a proven reputation for quality, Frazer custom EMS vehicles are ideally suited for licensing as an ambulance, generator powered emergency vehicle, Mobile Stroke Unit, or mobile clinic. Fortune Magazine listed Frazer as one of the fastest-growing inner-city businesses in the United States for 2017.